Brooks Launch 3 are neutral performance running shoes. The Brooks Launch 3 is the new iteration of the popular performance shoe from Seattle's brand. It is a perfect choice for neutral heel striker runners with medium/high arc for daily workouts and tempo runs. Current edition seeks better responsiveness through softer forefoot's blown rubber. Major change from its predecessor the Launch 2 takes place in the modern upper with thin 3D printed overlays featuring a more consistent forefoot and snug fit. Heel's collar grows a bit for improved comfort while laces are thicker for a more secure fastening. 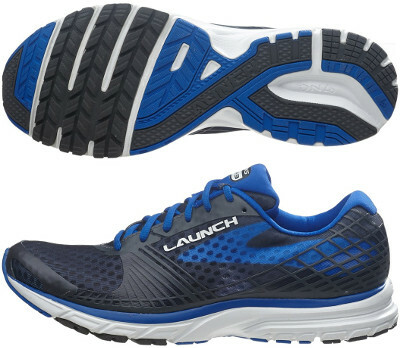 Launch 3 takes advantage of most advanced technologies from Brooks already used in other models like the popular Ravenna 7: flexible and durable outsole with improved rubber in the forefoot for more responsive toe-off and adaptive BioMoGo DNA cushioning in the midsole. Segmented crash pad provides extra support for heel strikers and regular 10 mm drop definitely helps for smooth transitions.